A parliamentary committee headed by Renuka Chowdhury has recommended frequent removal and collection of Chir Pine needles—highly inflammable due to its high resin content—in hilly regions to avoid forest fires. The committee also asked for more community involvement in forest management. The committee table its report “forest fires and its effect on environment, forests, bio-diversity and wildlife and remedial/preventive measures” in the Parliament on December 16. The frequency of forest fires has increased by almost 56 per cent, up from 15,937 in 2015 to 24,817 in 2016. Around 90 per cent of the fires are started intentionally by locals to clean the forest floor, burn undergrowth, to destroy evidence of illicit felling or to Scare wild animals. 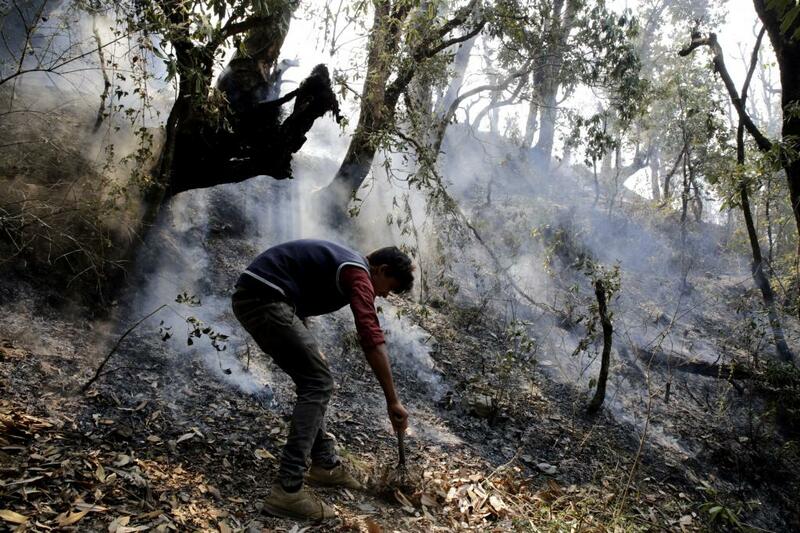 As per a Forest Survey of India report, 54 per cent of country’s forests are prone to fire, about 1.2 per cent of the total forest areas is prone to heavy, 6.28 per cent to moderate and 45.27 per cent to mild fires. The committee report recommends that Ministry of Environment, Forest & Climate Change should take up the inclusion of work relating to collection of chir pine needles as one of the activities under MGNREGA and steps should be taken for incentivising the clearing and collection of pine needles. Encroachment was also a growing problem, the report said. The Committee recommended state administration to ensure that there is no encroachment of forest land or violation of forest conservation rules. Municipal and town planning agencies in the states should take effective and practical steps, it added. The committee also noted the importance of traditional forest management operations like forest floor clearing, controlled burning and creation of water harvesting structures. It said that creation of fire lines is critical in fire fighting, because without fire lines, a fire can quickly get out of control. The committee recommended that adequate budgetary allocations should be made by the Ministry of Environment, Forest and Climate Change for fire line clearing. Use of drones for monitoring was recommended by the committee instead of fire watchers and CCTV cameras. The Parliamentary report said forest fires, which have become an annual event, have devastating effect on the environment. It causes damage to vegetation cover and loss of natural regeneration, loss of wildlife habitat, change in micro-climate, loss of biodiversity and invasion of weeds, adverse effect on the local livelihood, loss of carbon sink, and addition of greenhouse gases.